The owners of Aveyron West travelled the length and breadth of France before finding this idyllic setting in the Aveyron countryside to raise their family and create a quintessential holiday gite. Along the way, Allison and Mike made plenty of mental notes about what made gites especially good or bad for families so they could do all the right things when it came to their own - et voila! 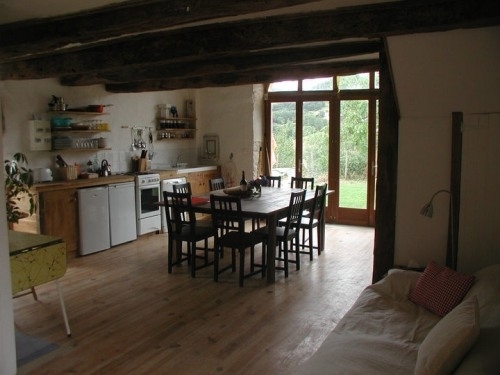 Aveyron West is a beautiful 19thcentury barn which has been sensitively transformed into a simply stylish and spacious 3 bedroom gite with private pool, ideal for large or extended families. Exposed stonework, timber beams and handmade stairs maintain the rustic character which is complimented by the furnishings and finishing touches, including contemporary leather sofas, handmade kitchen and smooth softwood floors, which are more forgiving that flags for toddler tumbles. Like all the best farmhouses, a huge kitchen/living/dining room is where it’s at on the ground floor. Mod cons include two fridges, a dishwasher and helpful baby kit, plus a large chestnut dining table takes pride of place in front of arched glass barn doors into the garden. Two double bedrooms are also on the ground floor so parents can be close to sleeping babies while enjoying leisurely evening meals long after bedtime. On the first floor, the gite has a large living room with fantastic views over the countryside, a high beamed barn ceiling and two comfy sofas. The living room makes a great space for children to play with the lovely selection of toys, from a dolls house and teddies to trucks and tug-alongs. A family bedroom for up to 4 is also on the first floor so early risers can break out of the bedroom without disturbing sleepers downstairs too much. 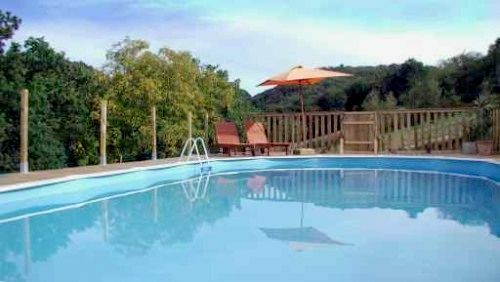 Aveyron West is set in 5 acres of meadows and farmland where the gite is completely detached from the owners’ farmhouse and has its own enclosed garden with a large table, chairs and barbecue. The owners are also very happy for little guests to discover the swings, slide, sand pit and tee pee in their fully enclosed garden. Organic fruit and veg is available to guests in season and children can help collect eggs from the free range hens. A little path leads to the fully fenced 33ft swimming pool and sun deck, with wooden loungers and parasols for relaxing in the sun. All in all, the owners are living their dream and want other families to share their slice of idyllic rural France. Aveyron West has 3 bedrooms, 2 bathrooms and sleeps up to eight family and friends, plus babies in cots. 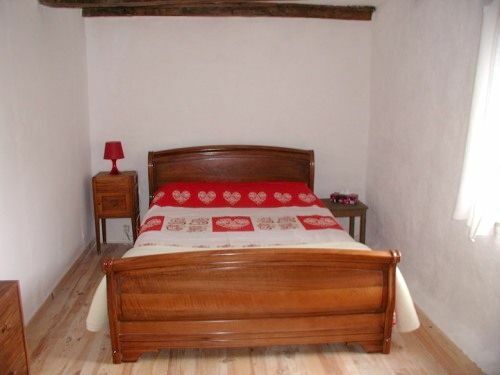 The gite has two double bedrooms on the ground floor and one family room on the first floor with one double and twin single beds. The bathroom on the ground floor has a bath with overhead shower, a basin, toilet and electric towel rail. Upstairs there is a shower room with hydromassage shower, basin & toilet. Aveyron West is tucked away in the unspoilt Aveyron region of France, boasting the beauty of the Dordogne without quite so many tourists to shatter the peace and sedate pace of life. 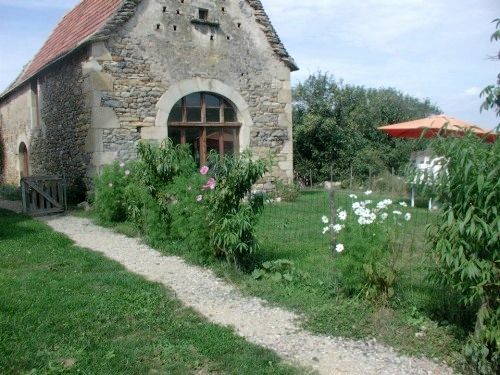 The gite itself is deep in this glorious countryside, in the tiny hamlet of Froment and 4 minutes drive from the village of Salles Courbaties, with a shop and cafe bar. It’s the perfect spot to get away from it all but civilisation is only 10 minutes drive away in picturesque Villeneuve with a great bakery, cafe, shops, banks and the very good Terre et Galet restaurant. On Sunday mornings, locals gather on the cafe terrace as a small market comes to the cobbled village square. 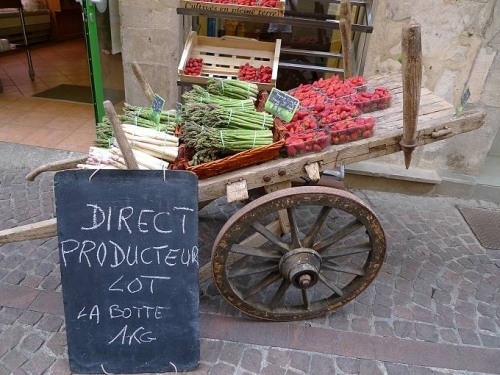 Bigger markets in the area which beat supermarket shopping hands down, include bustling, colourful Villefrance on Thursdays and Saint Antonin Noble Val on Sundays. Both these towns have beautiful olde worlde charm and a riverside setting to picnic with the fresh local produce. Figeac, (25 minutes drive) is considered cosmopolitan by Lot standards and is an elegant, medieval town while the capital city of the Averyon region is Rodez (35 minutes). In addition to the market towns, this corner of the Lot features many of ‘Les Plus Beaux Villages de France’ to explore, perched in panoramic settings, with narrow winding streets which are unchanged from medieval times. Najac and Belcastel are just a couple within easy reach of the gite. Nearest Medical Services (GP & A&E): The host is a registered nurse (UK) and trained first-aider. GP in Villeneuve (9km). A&E in Villefranche (24km). Sleeps 8 in one quad room on the first floor and 2 x double rooms on the ground floor, 2 bathrooms one with bath and one with hydromassge shower. 10 minutes drive away in picturesque Villeneuve with a great bakery, cafe, shops, banks and the very good Terre et Galet restaurant. 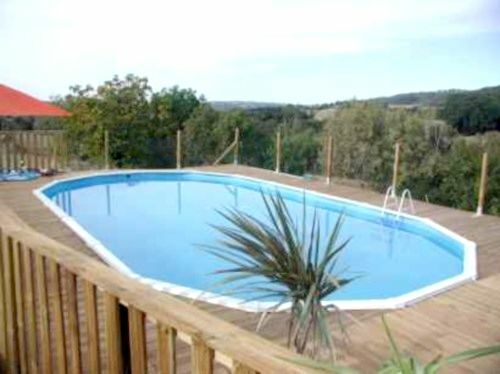 Good sized pool, safely fenced with decking area and sun loungers. 2 booster seats, baby bath, baby bouncer, baby monitors, steriliser, potty, stairgates, bed guards, socket covers, plastic crockery, plastic cutlery & sippy cups. Pre arrival shopping is available and welcome pack. Buckets and spades, ride-ons, trikes, swings, sand pit, paddling pool, play house, trampoline, swings, slide, small sand pit & Indian teepee. Beauty therapist available by appointment. Garden and seating area and BBQ, pool with decked area. Cots, 1 travel and 1 wooden, 1 highchair. Mike and Allison could not have been friendlier or more helpful - we had a lovely holiday in the beautiful Aveyron countryside. Avyron West is the best rustic French Gite we've stayed in. Everything ties in perfectly, from the hand made kitchen to the original exposed beams. With three well sized bedrooms we all had are own space and everyone slept well on the comfortable beds. We have three boys, 4yrs, 2yrs and 6 months. All three of them had the best time ever, a huge garden with plenty of toys including a great sandpit, a perfect sized swimming pool, and plenty of shaded areas for Max our youngest to sit and play. The surrounding area provides many great walks with some of the most amazing scenery, also nearby is one of the most amazing gardens which for 3 you can walk around and soak up the surroundings. The owners Mike & Alison, are the most welcoming and friendly owners we've met, nothing was ever too much trouble and they always went out of their way to make our stay as comfortable as possible. We weren't guests we were part of the family. 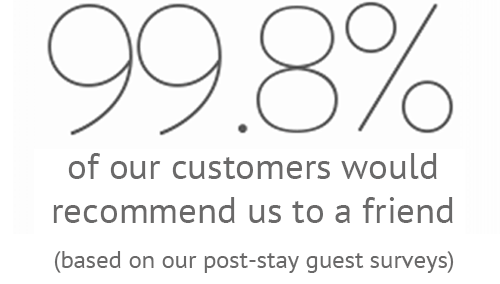 I highly recommend staying at Avyron West and we will definitely be coming back again. The gite was perfect for taking our parents and two small babies on holiday. 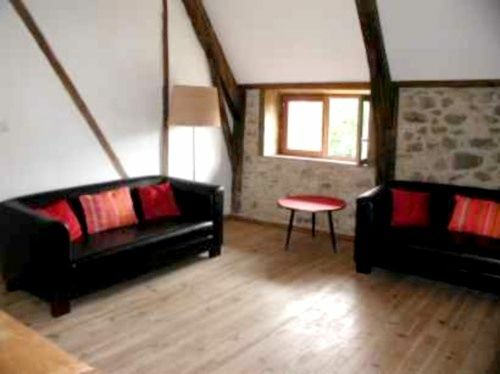 The gite is well appointed, spacious and full of charm. The accommodation, garden and pool are all very baby friendly enabling us all to relax and soak up the stunning surroundings. The large amount of toys, books, bath and garden toys available meant there was never a dull moment. The owner's and their children are extremely friendly and welcoming, always on hand to help, yet very respectful of space also. A wonderful holiday and easy journey from Rodez. We would highly recommend to friends and family.